Zumba Fitness is a global lifestyle brand that fuses fitness, entertainment and culture into an exhilarating dance-party workout. Coined “fitness-parties,” Zumba classes blend upbeat world rhythms with easy-to-follow choreography, which provide effective, total-body workouts. Founded in 2001, the company is now the largest branded fitness program in the world -- reporting more than 14 million weekly class participants, in over 140,000 locations, across more than 150 countries. In addition to its original Zumba® program, the company also offers a range of specialty classes, including Zumba Gold® (for active older adults), Zumba® Toning (body-sculpting class that uses maraca-like Toning Sticks), Aqua Zumba® (the ultimate “pool party” workout), Zumbatomic® (Zumba routines for kids), Zumba Sentao™ (chair-based Zumba class that strengthens, balances and stabilizes the core) and Zumba® in the Circuit (a 30-minute workout that combines signature Zumba® moves with circuit training at timed intervals). The Zumba® fitness lifestyle is rounded out by the company’s many consumer product offerings, including DVD sets, music collections, multi-seasonal apparel and footwear, video games, Fitness-Concert™ events and a lifestyle magazine. For more information about Zumba Fitness programs and products, or to find a live class, visit zumba.com. Majesco Entertainment Company is a leading developer and publisher of video games for the mass market. Building on more than 20 years of operating history, the company is focused on developing and publishing a wide range of casual and family oriented video games on all leading console and handheld platforms as well as online, social networks and mobile devices. 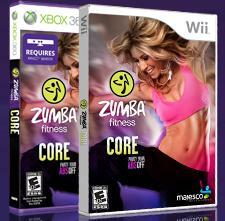 Product highlights include Zumba® Fitness, Cooking Mama™ and NBA Baller Beats™. The company's shares are traded on the Nasdaq Stock Market under the symbol: COOL. Majesco is headquartered in Edison, NJ with offices in San Francisco, CA, Brockhamptom, UK, and a social games development studio in Foxboro, MA. More info can be found online at majescoent.com. Nintendo trademarks and copyrights are properties of Nintendo. Kinect, Xbox, Xbox 360, and Xbox LIVE are either registered trademarks or trademarks of the Microsoft group of companies. **All information provided through PR company. Wach for my Zumba Fitness Core review sometime next month!